How to split Audible audiobook into chapters ? Easily split audible audiobook into separate chapters or or remove unwanted silence without losing sound quality. Audible.com is the biggest worldwide audible library, providing thousands of audiobooks to download or purchase. However, these kind of audiobook’s duration is just couple hours to a bit more than 30 hours and most of them are DRM Protection. It turns out that you would have poor experience listening to audiobook, especially if you prefer specific chapter and want to reread or spit it. 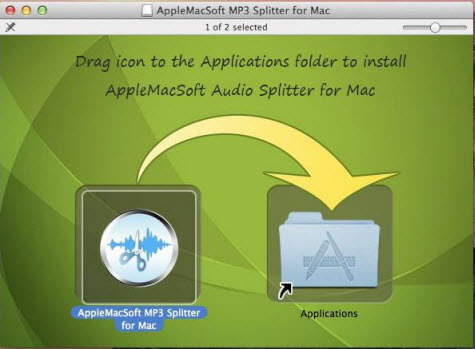 Fortunately, AppleMacSoft MP3 Splitter allows users to splitting Audible audiobooks into separate chapters and cut unwanted parts, so that you can easily browse or select every chapter. The audiobook you used to purchase from audible store is AA or AAX which is DRM Protection file and which is only listened to and gotten through authorized devices. 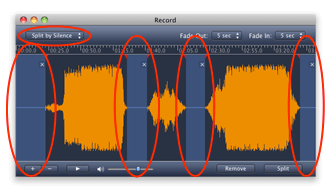 Additionally, AppleMacSoft MP3 Splitter supports only MP3 and M4A, but not AA or AAX. If you want to split audible audiobook into multiple chapters, first of all, you need to convert AA or AAX to unprotected MP3 file of audiobook. Once you get the common MP3 files, you can copy purchased audible audiobooks to any portable players as much as you want. And you can share with others or import MP3 files to audio editor without any restriction. Here, you should try Audiobook Converter to convert audible AA/AAX to MP3 file. Please learn more about the manual here: How to Convert Audible AA, AAX to MP3 on Mac? First of all, you need to download the software from the link above and install MP3 Splitter by simplely drag MP3 Slitter to your applications folder. Step 1: Open MP3 Spitter from the Applications folder. The window as below will be seen. Step 2: Add a file. Drag and drop an Audible audiobook file directly onto the application. The uploded file will be seen as an audio wave. Because every chapter of audiobook has a silence part, choosing split by silence is more appropriate. Check the pop-up button "Split by silence" located at the upper left corner of the main interface. Dialog "Silence detect" appears. 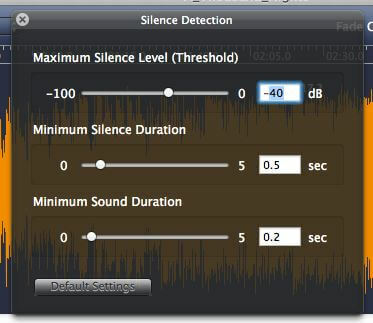 Here you can modify the silence detection settings. 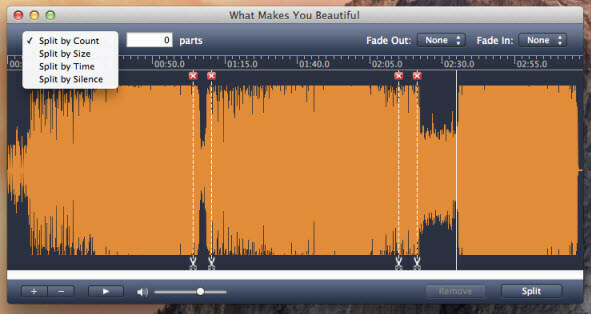 The silent fragments will highlighted on the waveform automatically. The highlighted silent fragments will not be reproduced in the split files. The built-in player located at the left bottom will help you check the exact location of each chapter. Step 3: Click the button "Split" on the right bottom. Select the destination folder in the dialog and press "ОK". The new files will be saved in the specified folder. Guideline seems a bit complicated, but when you get familiar to it, you will find the operation actually coming handy. It becomes convenient for you to choose whatever chapter you want by splitting the long audiobook into several chapters without re-encoding. so it exactly keeps sound quality of original audiobook files. You can easily select what you want. It will save your precious time and facilitate your audiobook access. 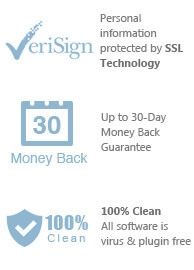 Not sure if our software is right for you? Try out the free demo today Get started in just minutes! 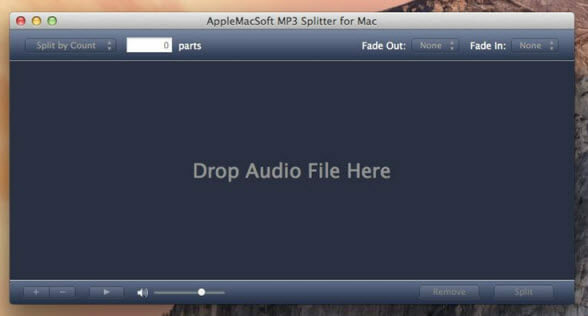 You can immediately download the very last version of MP3 Splitter for Mac from our website and start to trial it right now !